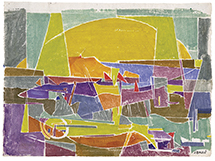 Bar Harbor --- c. 1949, White Line Color Woodcut. Edition 5 or less, one of a few variations. Signed J. Rothschild in ink, bottom right sheet corner. Image size 7 7/8 x 11 inches (203 x 279 mm); sheet size 8 1/4 x 11 inches (200 x 279 mm). A fine, painterly impression, with fresh colors, on off-white wove paper; the full sheet with the image printing to the deckle edge on three sides, and with a 1/4 inch margin on the top sheet edge; 3 tack holes (presumably for drying) in the top margin; in excellent condition. Very scarce. Framed. Judith Rothschild (1921-1993) was one of only a few contemporary artists to be given solo exhibitions at the Metropolitan Museum of Art at the time of her retrospective in 1989. Two years later, in 1991, a one-woman show of Rothschild's relief paintings appeared, by the gallery's invitation, at the prestigious Tretyakov Gallery in Moscow. She was the first living Western artist to have a solo exhibition there. 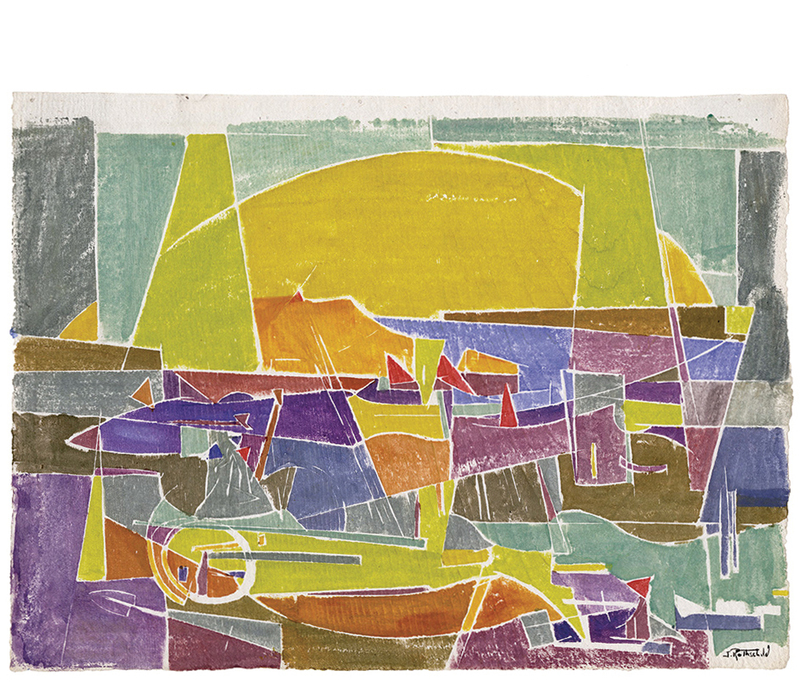 In 2002 the exhibition of her work at the Marble Palace (The Russian Museum) was the first show ever of an American abstract artist in Saint Petersburg, with over 48 works–from her early paintings to collages of the last period–on display. Rothschild’s work is included in: The Phillips Collection, Tate, Harvard Art Museums, Metropolitan Museum of Art, Cleveland Museum of Art, Princeton University Art Museum, NYPL, and the National Gallery of Art..